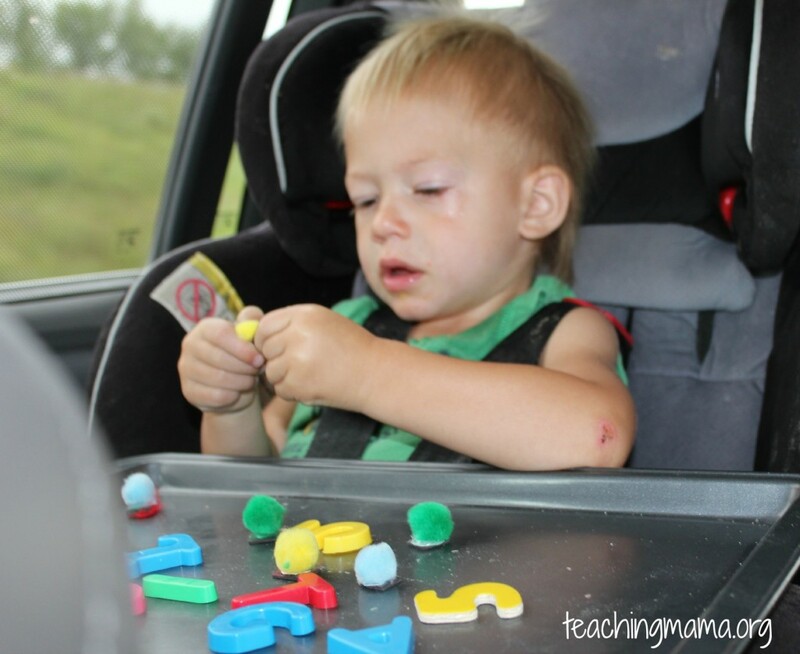 Riding in the car with little ones can be challenging, especially when you are taking a long trip! 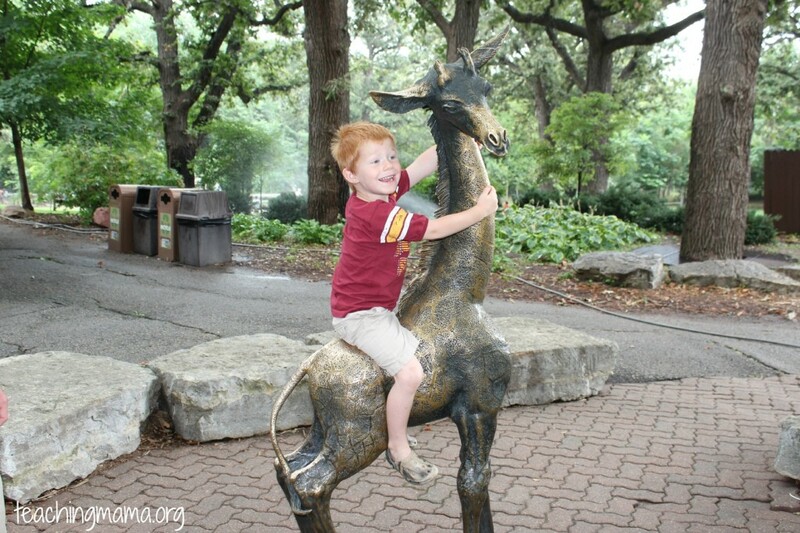 We went to the Omaha Zoo on Monday, which is only a two hour trip. To make the trip run smoother, I planned 5 activities to do with them in the car. I would say it was a success and they stayed busy in the car with hardly any whining or crying. 1. Create a race track. 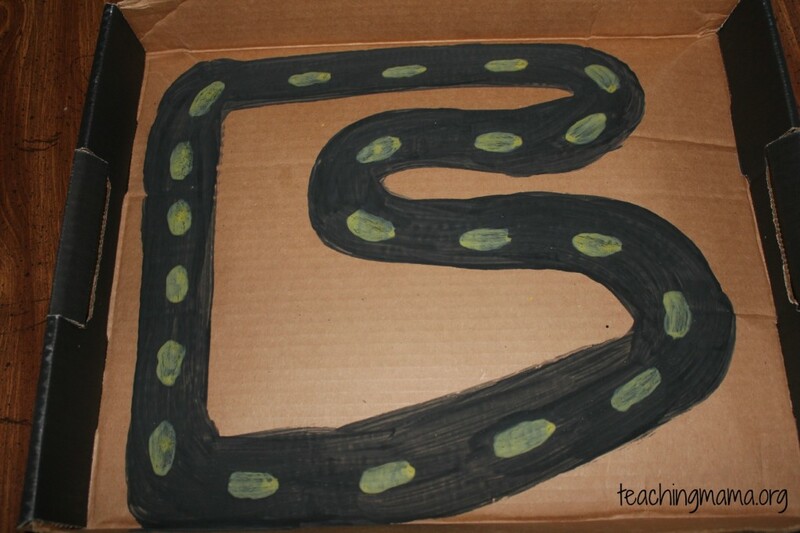 To make this, paint a track with black paint on a box lid. Then paint some yellow lines in the middle of the track. 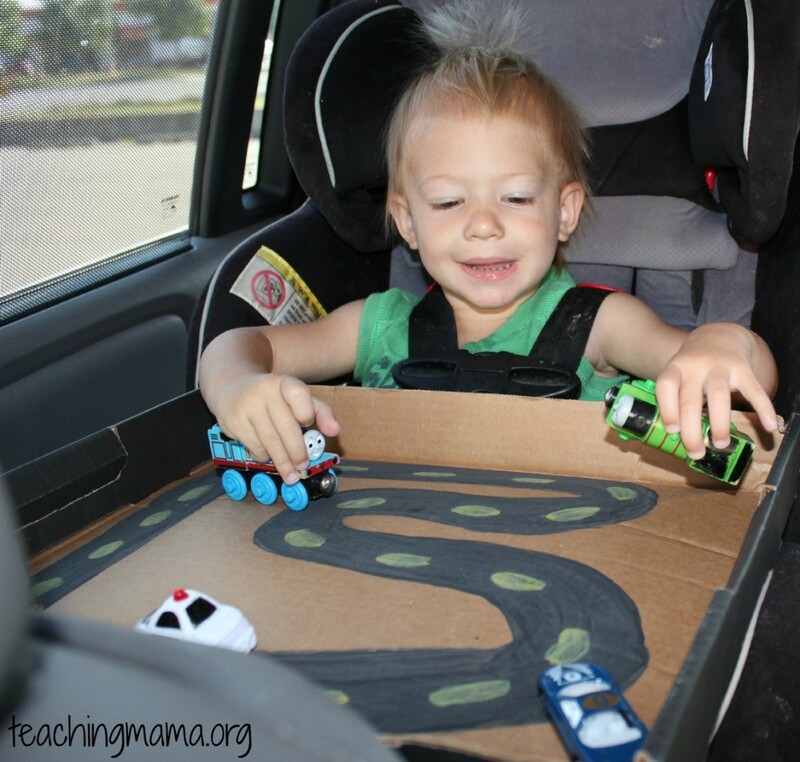 Give your little one trains or cars to play with in the car. The edges on the box help keep the cars from falling on the ground. 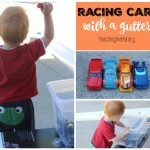 My little one gets so annoyed when he drops his cars or trains in the car and it’s hard for me to get them for him while driving! So this is the perfect solution. 2. Color on top of a tray. This helps keep their crayons together and gives them a hard surface to color on. I love using trays! 3. 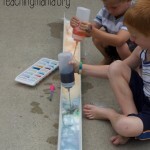 Play with magnets on trays. 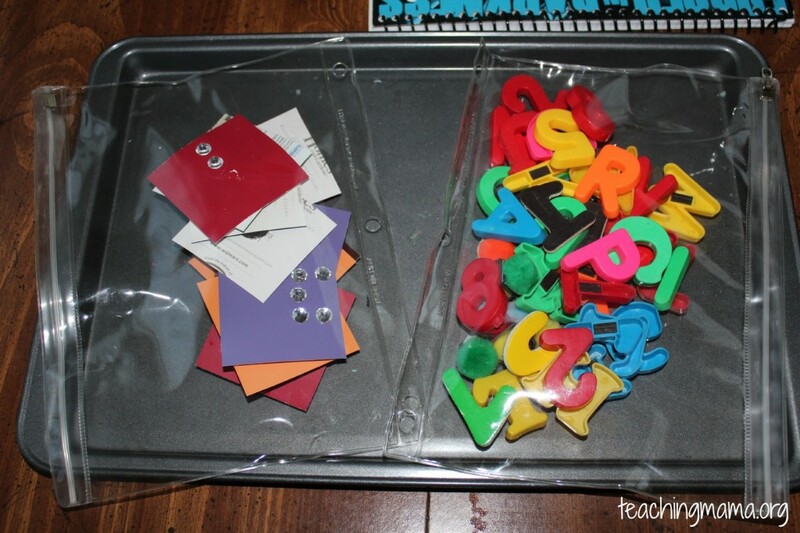 Take some alphabet letters, magnetic pompoms or anything with magnets on them to play with on a cookie sheet. 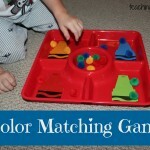 We also played this color matching game on the trays. 4. Bring a basket of toys and books. 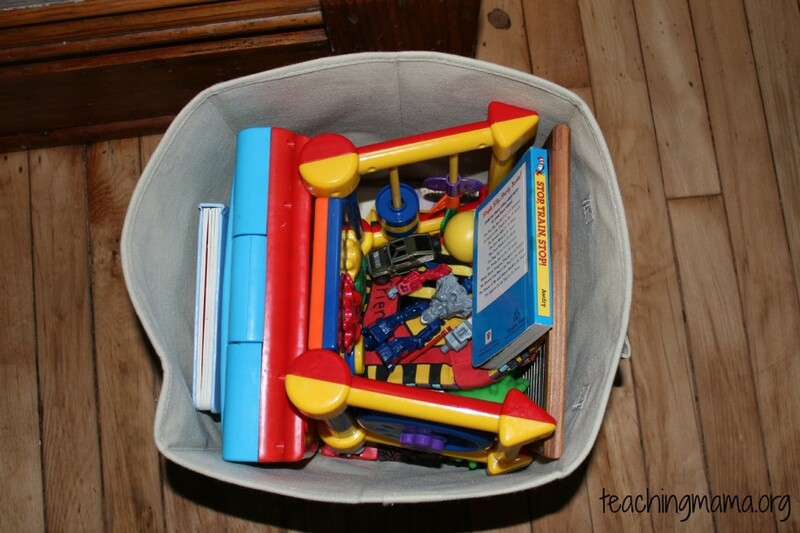 Gather a few favorite toys and books and bring them in the car in a basket. This keeps the toys organized and easy to find in the car. This is a simple idea, but it worked well for us. Then it’s also easy to bring them back inside. 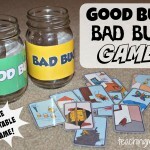 Like I said, this is a simple game for a preschooler, but it helped the time go by fast! After doing these 5 activities, we did let them have some screen time playing games on our phones. All in all, it was a successful trip and I loved having these planned activities. Nothing is more frustrating than having tired, whiny, crying children who are bored in the car! Oh and my last piece of advice is to bring snacks…lots of snacks! 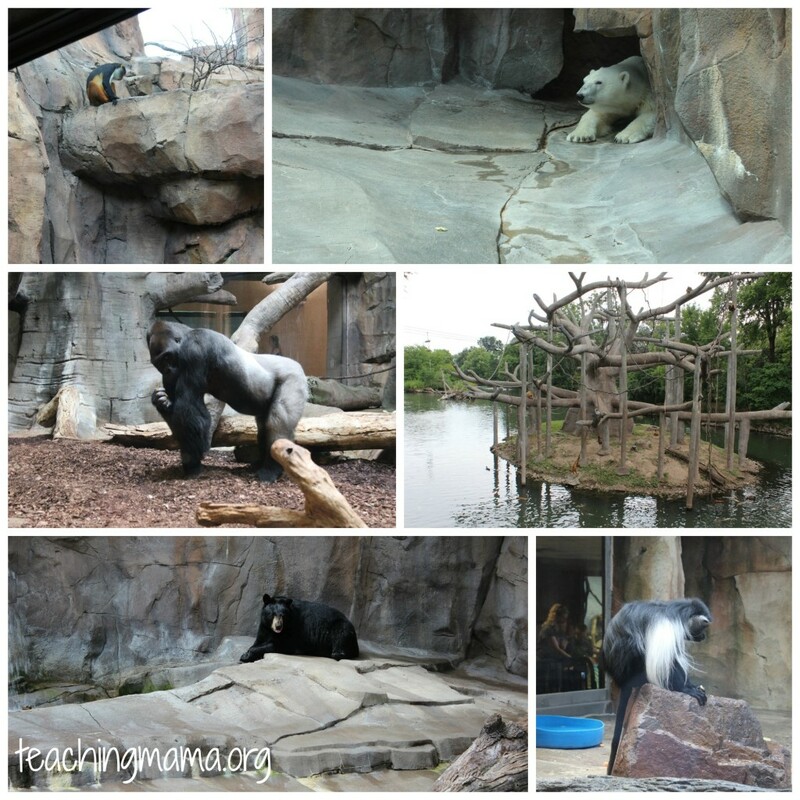 Here are a few pics from the zoo! 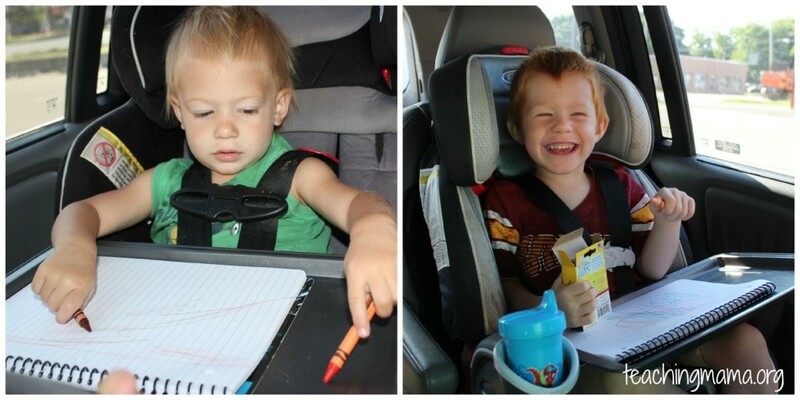 What tips do you have for traveling with kids in the car? Great post, Angela! 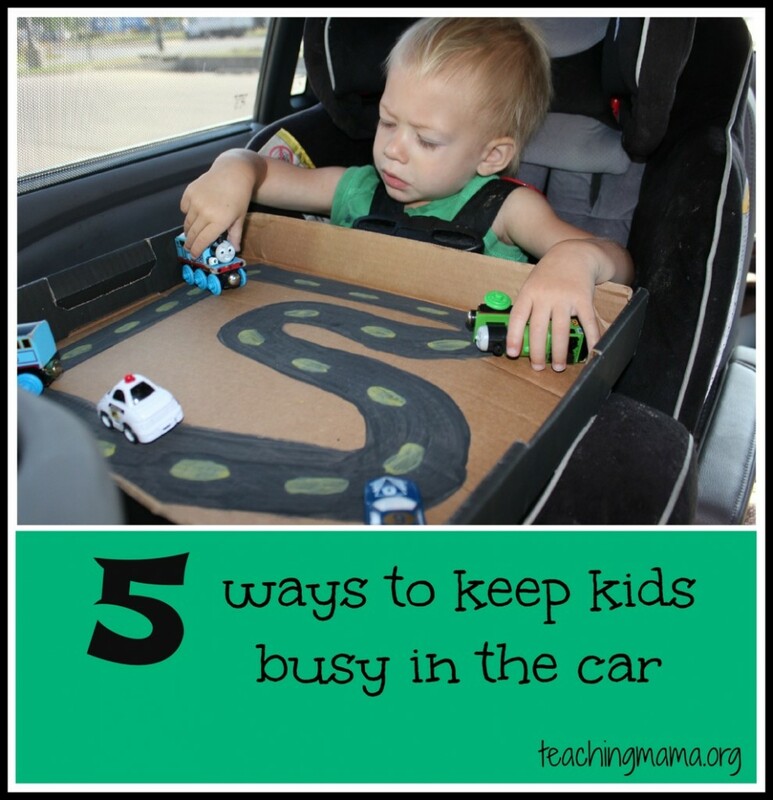 It’s so hard to find ways to occupy toddlers and young preschoolers in the car – they don’t quite have the dexterity to hold on to their toys. These are great ideas!! Thanks, Anna! It is very hard to keep young kids happy in the car! Thanks! It has helped us out tremendously! 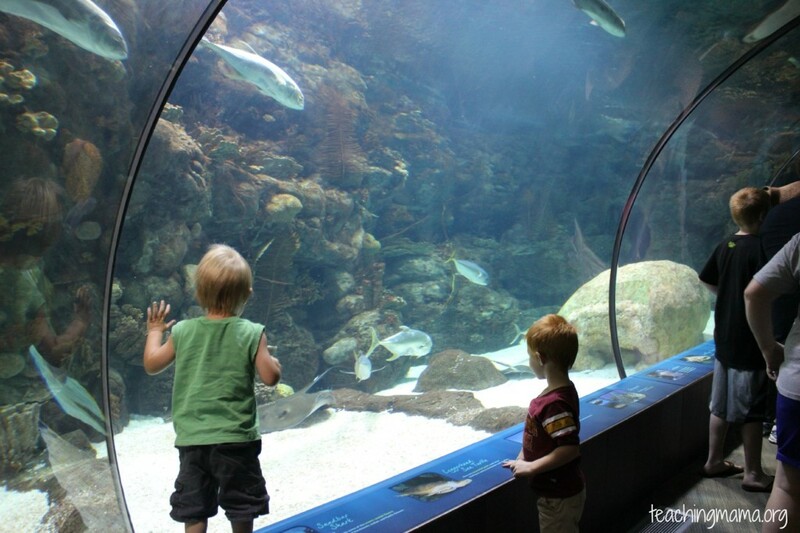 I plan to take a little trip with my boys to the zoo before the cold weather sets in, so this was a perfect post! Featuring this at Family Fun Friday! I think these are all great ideas, and on VERY long car trips (10 hrs, 14 hrs, even 21 hrs to Florida…) I do occasionally break out some of my old school but similar things to keep my 4 kids busy. On the other hand, I fear that with hand-held technology (or built-in DVD players) and an internet full of fancy ideas for parents to implement, today’s kids are losing out on the opportunity to learn patience and how to entertain themselves, both skills that are important in being successful and independent adults. Parents need to be careful of just handing their children something else to do every time he or she gets bored. And at some point, both the child and the parents are going to have to deal with just being in the car. I’ve been on both ends of it, driving with my family as a child on weeks-long trips across the country, and as a parent, with 10-day road trips once per year to 26 states and counting (in an SUV, not an RV, just to be clear). There’s a lot to see and experience out there on the road, whether you’re just heading over to Grandma’s or traveling 4 states away, just make sure you experience some of it. Thanks for the useful tips and tricks, as always.